I've just got back from Bett 2015, and thought I'd write a short blog post to share some of the things I saw there today. My first observation is that it was great to see the Raspberry Pi having such a strong presence there this year, thanks to the support of CPC. Last time I was at BETT was in 2013, when there was only space to have one demo station. This year, there were a couple of tables set up with Raspberry Pis for visitors to use, and a row of seats behind too. There was a large presentation screen at the front, and a packed programme that has seen a new talk delivered every half an hour or so for the last three days, with one more day to go. I attended several of the sessions. Michael Horne from CamJam opened the day with a talk about the two EduKits that provide a tin of components to enable simple electronics experiments. He says there are already over 1,200 of the kits out there, and you're welcome to use the EduKit project sheets with your own components if you have them. The first kit includes a breadboard and LEDs you can use to build and program a traffic light, and the second kit has a range of sensors (including temperature and movement) and can be used to make a burglar alarm. Later on in the day, there was a chance to use the kits to build a reaction timer in a session led by Matthew Parry, head of computing at Swanwick School and Sports College. He talked us through building the kit and programming it in Scratch, and it was great to have such a hands-on and practical workshop at the heart of the Pi booth. Dave Honess gave a presentation of the weather station project, which is being sponsored by Oracle, and will see 1,000 Pi-compatible weather station kits given away to schools. The data from the weather stations will be uploaded to an Oracle cloud, and everyone will be able to access the full data sets for data processing (even those who don't have one of the kits). The kit is able to detect air pressure, air quality, humidity, wind speed and rainfall, and students will be able to build a MySQL/PHP website to display their data. If you're curious, the fastest recorded wind speed from somebody blowing on the anemometer is 32mph. Phew! 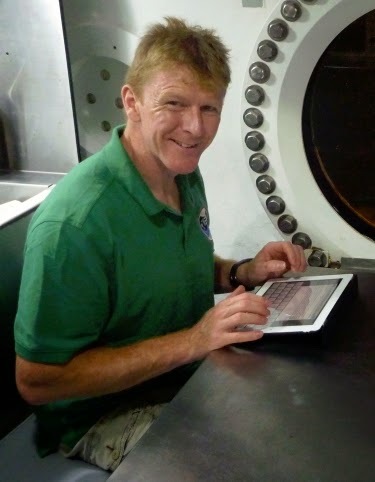 One of the most exciting talks concerned Astro Pi, which is sending two Raspberry Pis to the International Space Station with British ESA astronaut Tim Peake (pictured here in an underwater laboratory, photo courtesy of NASA). School students have a chance to design (and, in the case of secondary schools, code) the science experiments, powered by the Pi. This is an incredible opportunity for schools that take part, and it will be fantastic to see which projects are selected to go into orbit. The key things to bear in mind are that the astronauts only have four hours to give this project (plus four hours of contingency time), so any projects need to be quick to set up and use. Projects are likely to involve setup, continuous logging and comparison with data on earth logged at the same time. There was also a suggestion that a project that used both Pis to build in redundancy might work well, given the risk that radiation could corrupt memory and prompt one of the Pis to restart. The last talk of the day I caught was about Wolfram Mathematica. There were two main takeaways from this: firstly, the language is designed to deliver results without too much preamble. The talk showed how data could be processed and graphed without needing the setup and syntactical scaffold common in languages like Python and Java. Secondly, the language incorporates a lot of knowledge already. There wasn't a live connection, so it wasn't possible to demonstrate this, but presenter Jon McLoone from Wolfram said the language can answer questions like "Where is the International Space Station now?" or "What was the weather like in Rome when David Cameron was born?" I look forward to digging into this further. He also demonstrated the drawing of a community graph, which I'm keen to try on my Facebook friends. If you're new to Mathematica, check out the free bonus Mathematica chapter from Raspberry Pi For Dummies. It was great to meet the Raspberry Pi team and to see so many great projects there. I spent some time with Sonic Pi creator Sam Aaron looking at how to optimise my Sonic Pi tune, and enjoyed meeting others I know from Twitter. Bett is still running tomorrow (Saturday), so there's still time to go along and drop in on the Raspberry Pi team. If you went to Bett, what were your highlights? As part of the updated second edition of Raspberry Pi For Dummies, my co-author Mike Cook has written a great introduction to Mathematica, a maths-based application that's capable of creating some great mathematical art, among other things. Usually, Mathematica costs about $2,500, but there's a free version on your Raspberry Pi, so this highly exclusive software is now available for everyone to experiment with. After we'd added chapters on Minecraft, Sonic Pi and RISC OS and updated the rest of the book (was that plug too shameless? ), there wasn't room to include the Mathematica chapter in Raspberry Pi For Dummies. So we made it available for free too, as a downloadable PDF that you can read on screen or print out. It's gone through the same editorial process as the rest of the book. If you make something you like, please send me your screenshots. 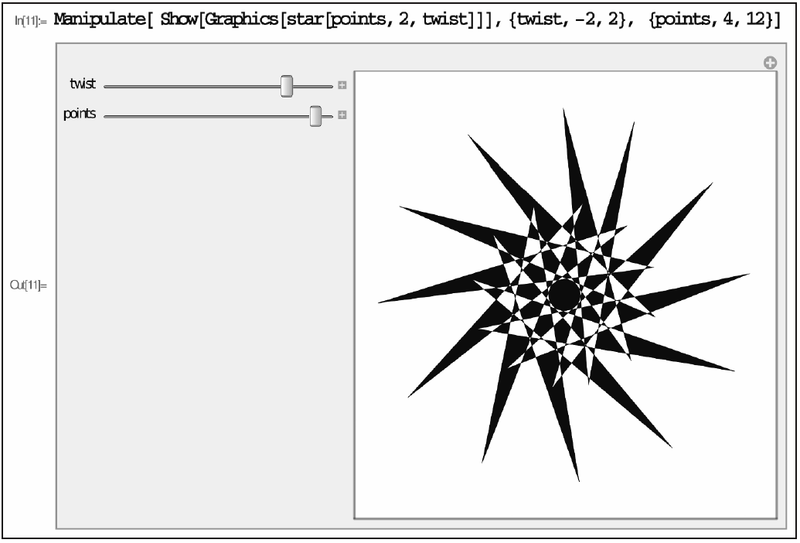 It would be great to see what you're making with Mathematica. 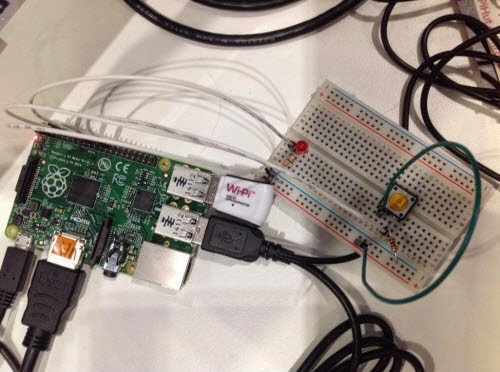 Find out more about Raspberry Pi For Dummies here.